What is bionanoscience? It is the exciting new field where the worlds of biophysics, nano-engineering, and biology meet. At the Department of Bionanoscience we are fascinated by the question of how molecules work together to create life at the cellular scale. A better understanding of the cell and its behaviour is also relevant for the development of new biomaterials (in food or high-tech materials) and new energy sources (biofuels). In our research programs we apply innovative tools from nanotechnology to understand molecular mechanisms at the single-molecule scale. We develop nanoscopy techniques to observe the dynamics of molecules in their native environment at high resolution. We use biomimetic and synthetic biology approaches to recreate functional cellular modules, and we combine all these approaches with cell biology, biochemistry, and theoretical modelling. Our goals are ambitious: for example, we aim to develop technology that allows to determine the sequence of a single protein using advanced fluorescence techniques. We aim to understand the functional relation between gene expression and the three-dimensional organization of DNA-protein complexes in cells, and we aim to re-build essential biological functionality from molecular components using a bottom-up approach, eventually leading to the design of a synthetic cell. 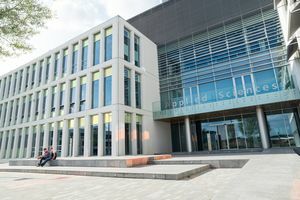 The research in the Department of Bionanoscience focuses on three main areas: (I) Single-molecule biophysics; (II) Synthetic biology; (III) Cell biology. A brief general description of these research areas is given below. A more specific description of the research programs of the different PIs is given under Research labs. Single-molecule biophysics is ideally suited to studying the dynamics of individual biomolecules, which molecular biology and structural biology generally cannot access. Examples include force spectroscopy and fluorescence spectroscopy of DNA-protein interactions and RNA/protein folding. Single-molecule biophysics yields a physical understanding of the cell’s molecular constituents. Both these techniques and the exploration of the sub-cellular world go hand-in-hand with advances in microscopy, for example sub-wavelength-resolution imaging. Research in this direction involves cutting-edge technique development that is needed to monitor dynamic structures in the context of the cell. Synthetic biology is a novel research direction where one views the biological cell as a system of ‘biobrick’ components or modules. Engineering this system is now possible with the tools of cell biology, molecular biology, and biochemistry. Examples include the engineering of pathways in bacteria to produce novel antibiotics or hydrogen. Outside the cell, functional cellular modules can be reconstituted in order to study their fundamental properties in the absence of full cellular complexity. This ability to create cellular modules from isolated components is expected to lead in the future to partly or fully synthetic cells. The ability to engineer a synthetic cell would provide a hallmark for our understanding of essential cellular processes. Cellular biology aims to identify and study the role of different players and levels of organization in individual cells. Examples include the spatial and dynamic organization of the genome in the cell nucleus, or viral invasion into the cell and the associated cellular countermeasures. Biophysical tools can help measure a cell’s mechanical properties or track the behaviour of single-molecules within the environment of the living cell. Probing at the level of single molecules within the living cell can be used to quantify the activity of specific molecular machineries in vivo and understand the context of networks and systems biology in which these processes take place. The development of novel nanoprobes and nanosensors pushes the field of bionanoscience forward. An example of a direct application target of such bionanoscience techniques is nanomedicine. Important directions include nanodevices/chips for therapy, diagnostics, imaging, and sensing; the development of specific target molecules for therapies; and the molecular engineering of biomimic materials.